I have difficult news. We've learned that Mike Daisey's story about Apple in China - which we broadcast in January - contained significant fabrications. We're retracting the story because we can’t vouch for its truth. This is not a story we commissioned. It was an excerpt of Mike Daisey's acclaimed one-man show "The Agony and the Ecstasy of Steve Jobs," in which he talks about visiting a factory in China that makes iPhones and other Apple products. The China correspondent for the public radio show Marketplace tracked down the interpreter that Daisey hired when he visited Shenzhen China. The interpreter disputed much of what Daisey has been saying on stage and on our show. 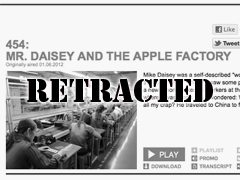 On this week's episode of This American Life, we will devote the entire hour to detailing the errors in "Mr. Daisey Goes to the Apple Factory." Daisey lied to me and to This American Life producer Brian Reed during the fact checking we did on the story, before it was broadcast. That doesn't excuse the fact that we never should've put this on the air. In the end, this was our mistake. We're horrified to have let something like this onto public radio. Many dedicated reporters and editors - our friends and colleagues - have worked for years to build the reputation for accuracy and integrity that the journalism on public radio enjoys. It's trusted by so many people for good reason. Our program adheres to the same journalistic standards as the other national shows, and in this case, we did not live up to those standards. A press release with more details about all this is below. We'll be posting the audio of the program and the transcript on Friday night this week, instead of waiting till Sunday. This American Life will devote its entire program this weekend to detailing the errors in the story, which was an excerpt of Mike Daisey's critically acclaimed one-man show, "The Agony and the Ecstasy of Steve Jobs." In it, Daisey tells how he visited a factory owned by Foxconn that manufactures iPhones and iPads in Shenzhen China. He has performed the monologue in theaters around the country; it's currently at the Public Theater in New York. Tonight’s This American Life program will include a segment from Marketplace’s Rob Schmitz, and interviews with Daisey himself. Marketplace will feature a shorter version of Schmitz's report earlier in the evening. When the original 39-minute excerpt was broadcast on This American Life on January 6, 2012, Marketplace China Correspondent Rob Schmitz wondered about its truth. Marketplace had done a lot of reporting on Foxconn and Apple’s supply chain in China in the past, and Schmitz had first-hand knowledge of the issues. He located and interviewed Daisey's Chinese interpreter Li Guifen (who goes by the name Cathy Lee professionally with westerners). She disputed much of what Daisey has been telling theater audiences since 2010 and much of what he said on the radio. During fact checking before the broadcast of Daisey's story, This American Life staffers asked Daisey for this interpreter's contact information. Daisey told them her real name was Anna, not Cathy as he says in his monologue, and he said that the cell phone number he had for her didn't work any more. He said he had no way to reach her. "At that point, we should've killed the story," says Ira Glass, Executive Producer and Host of This American Life. "But other things Daisey told us about Apple's operations in China checked out, and we saw no reason to doubt him. We didn't think that he was lying to us and to audiences about the details of his story. That was a mistake." The response to the original episode, “Mr. Daisey and the Apple Factory,” was significant. It quickly became the single most popular podcast in This American Life’s history, with 888,000 downloads (typically the number is 750,000) and 206,000 streams to date. After hearing the broadcast, listener Mark Shields started a petition calling for better working conditions for Apple's Chinese workers, and soon delivered almost a quarter-million signatures to Apple. The same month the episode aired, The New York Times ran a front-page investigative series about Apple's overseas manufacturing, and there were news reports about Foxconn workers threatening group suicide in a protest over their treatment. Faced with all this scrutiny of its manufacturing practices, Apple announced that for the first time it will allow an outside third party to audit working conditions at those factories and – for the first time ever – it released a list of its suppliers. Mike Daisey, meanwhile, became one of the company's most visible and outspoken critics, appearing on television and giving dozens of interviews about Apple. Some of the falsehoods found in Daisey's monologue are small ones: the number of factories Daisey visited in China, for instance, and the number of workers he spoke with. Others are large. In his monologue he claims to have met a group of workers who were poisoned on an iPhone assembly line by a chemical called n-hexane. Apple's audits of its suppliers show that an incident like this occurred in a factory in China, but the factory wasn’t located in Shenzhen, where Daisey visited. "It happened nearly a thousand miles away, in a city called Suzhou," Marketplace’s Schmitz says in his report. "I’ve interviewed these workers, so I knew the story. And when I heard Daisey’s monologue on the radio, I wondered: How’d they get all the way down to Shenzhen? It seemed crazy, that somehow Daisey could’ve met a few of them during his trip." In Schmitz's report, he confronts Daisey and Daisey admits to fabricating these characters. "I'm not going to say that I didn't take a few shortcuts in my passion to be heard," Daisey tells Schmitz and Glass. "My mistake, the mistake I truly regret, is that I had it on your show as journalism, and it's not journalism. It's theater." He's never actually seen one on, this thing that took his hand. I turn it on, unlock the screen, and pass it to him. He takes it. The icons flare into view, and he strokes the screen with his ruined hand, and the icons slide back and forth. And he says something to Cathy, and Cathy says, "he says it's a kind of magic." Cathy Lee tells Schmitz that nothing of the sort occurred. "In our original broadcast, we fact checked all the things that Daisey said about Apple's operations in China," says Glass, "and those parts of his story were true, except for the underage workers, who are rare. We reported that discrepancy in the original show. But with this week’s broadcast, we're letting the audience know that too many of the details about the people he says he met are in dispute for us to stand by the story. I suspect that many things that Mike Daisey claims to have experienced personally did not actually happen, but listeners can judge for themselves." "It was completely wrong for me to have it on your show," Daisey tells Glass on the program, "and that's something I deeply regret." He also expressed his regret to "the people who are listening, the audience of This American Life, who know that it is a journalism enterprise, if they feel betrayed." This American Life and its home station WBEZ Chicago had been planning a live presentation of Daisey's monologue on stage at the Chicago Theatre on April 7th, with Glass leading a Q&A afterwards. That show will be cancelled and all tickets will be refunded. This American Life episode will air on WBEZ at 8pm EST/7pm CST tonight and will also be available to stream and download on thisamericanlife.org at that time. It can be heard on public radio stations around the country this weekend. This American Life is produced by WBEZ Chicago and distributed by Public Radio International.